For those who desire a balance between portability, style, and reliability, the Portable Travel Cigar Humidor Case from Scotte is a fine choice indeed. 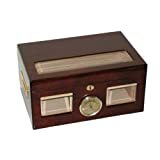 This wonderfully compact travel humidor will prove a great find for any cigar aficionado on the go who doesn’t want a bulky, hard plastic travel humidor. This feature-ridden gem is as solid as a travel humidor option as it gets. 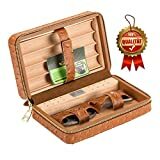 The Scotte Portable Travel Cigar Humidor Case features a nicely textured genuine leather exterior and zipper closure that keeps the contents protected and solidly in place. While the zipper itself could operate a little smoother at times, it is a small consolation for the peace of mind that your cigars won’t be flung out all over the place while in transport. 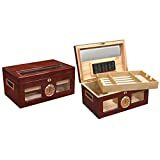 The interior of the Scotte Portable Travel Cigar Humidor Case is comprised of both cedar and pine wood which shelter a long, bar-type humidification unit. The humidification device is a solid performer, yet there is enough room for you to upgrade to the bar or tube humidifier of your choice. A 4-slot cigar tray is also included to help keep your favorite cigars in place and protected. The slots will accommodate fairly good sized cigars, yet some of your larger Gordos, however, might prove a little too tight of a fit. Capping it off are two leather accessory pouches on the inside of the lid just above the humidifier that are ideal for housing your cigar cutter and lighter or other must-have accessories. While not for rugged outdoor adventures and with a higher price-tag, along with some minor zipper issues, the Scotte Portable Travel Cigar Humidor Case is by no means perfect, but with its convenient size, solid construction and beautifully designed versatility, it is one of the best genuine leather travel humidor options available and just might be the perfect match for all of your travel cigar humidor needs.